I've always loved vector games of the 80's, and spent many a coin on Asteroids and Battlezone back in the day. Plus, the vector graphics looked ahead of their time back then, so that only made these games seem much more appealing. Anyway, over this past summer I had an opportunity to buy a vector cabinet locally, and jumped at the offer, considering the game was in such great condition. Space Duel is an interesting two player cooperative take on traditional Asteroids. Plus its a color vector game! There was only one problem I noticed with the cab, and that was a color blooming issue in the lower left corner of the vector tube. Actually it was more than just color, the convergence of the tube was pulling in that corner, but he adjusted the picture to be smaller in the center of the screen so the vectors weren't as affected as the colors were. This defect helped me in negotiating the price on the cab, and in my mind I thought it was really just a degaussing issue. After getting the cab home, and using an external degaussing ring, the color blooming was not going away. I open the cab and inspect around the tube to make sure there was proper shielding, and noticed the original speakers under the control panel, and above the monitor were swapped out for larger size cones, presumably to give it better bass response. Larger speakers also means larger magnets attached to the back of the speakers, which were upsetting the magnetic balance the cab was originally designed for. Since these are not high end car audio speakers with protective shielding, I would with have to either replace the speakers with original spec, or try to shield them myself. I chose the latter since the four larger speakers makes this cab sound tremendous! A quick googling led me to Andy Rondeau's Do-It-Yourself (DIY) Speaker Project. Although at the top of the article, he states this information is now outdated (as you can now buy expensive speaker shielding kits), I liked his DIY approach with cheap Home Depot supplies. So I measured my speaker drivers, and went to Home Depot to look for those same steel pipe cap/ covers (which were about $5 a piece). I also found some electrical boxes (for $1.50 a piece) with much thicker steel and approximately the same size, which fit quite snugly inside the cap covers. I decided to return the more expensive cap covers, and just stick with the cheap electrical boxes as combined they didn't seem to add any additional shielding from my testing. The boxes were a bit larger than the two speaker drivers behind the marquee, but fit perfectly over the speakers under the control panel. I used electrical tape to ensure the boxes didn't fall off, and to insulate the edge next to the speaker terminals. The results were amazing! 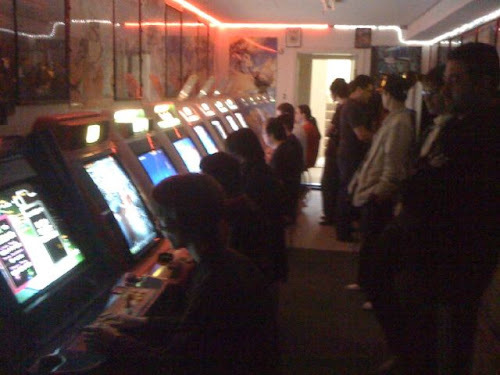 The underground arcade fighting scene has made a magnificent comeback in recent years, with local tournaments featured in bars, hotel conference rooms, and a handful of arcades left in existence, ultimately leading to a final showdown in Las Vegas (EVO). The above picture may look just like one of these fighting events, except its not. 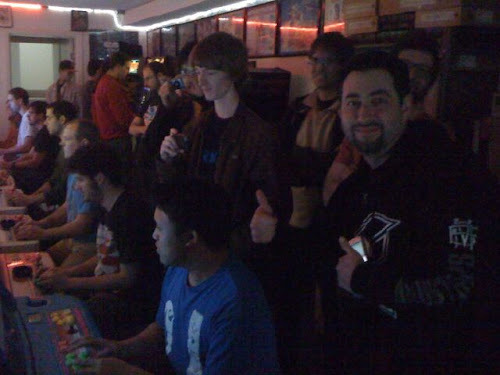 These people are not crowding around opponents beating each other to a bloody pulp, or trash talking one another with gripes about button mashing or forbidden combo hacks. These people are playing "shmups". Yes shmups, that ugly word used to describe the genesis of arcade games, the shoot-em-up. One ship against an armada of invading enemy. They shoot, you dodge, you shoot back. Simple in principle, yet amazingly satisfying. Modern shmups have evolved quite a long ways from the original Space Invaders of the late 70s. In fact they've more accurately mutated into a sub-species of score based challenge that have nearly caused their own extinction, save for a very few die-hard obsessed fans. 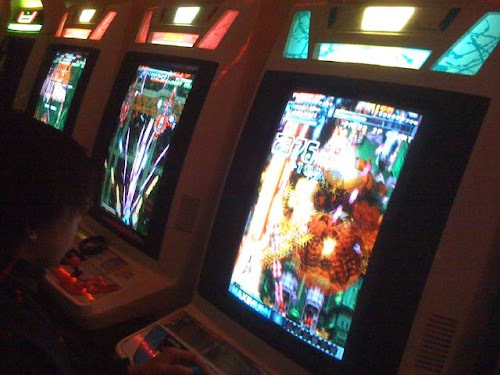 With only a few companies left today making shmups for arcade and console, its hard to believe anyone much cares about the genre, but these dark grainy cellphone pictures you are seeing here show there is still an active underground following, and not just in the SF Bay Area, but around the world [see videos included at the end of this post]. Will shmups one day be lifted from its cult following to be recognized as a legitimate tournament sport like fighting games have? Unlikely, as score based single player games typically don't fair well in tournament style events. Although I've been successful in the past running shmupmeet challenges, its not anything like the Player vs Player excitement of a spectator's sport. Still, there are a few hybrid style fighting-shmups, and other interesting ways to pit two players against each other in a normally co-operative shmup, which make for some great smack talk and elbow jabbing between opponents. More shmupmeet videos on youtube here. I've started picking up a few PCBs again. This time I'm filling in the gaps in my collection with ones I've passed over before, or in the case of Shikigami No Shiro, buy back something I had previously sold. With all of these being cheaper than typical XB360 games, its was hard to pass up. Shiki and Raystorm are games I consider my least favorite of their respective series, but I'm surprised to be digging Raystorm's atmosphere (mostly because of the Zuntana BGM). I'm also gaining an affinity for older Visco shmups. While not one of the best shmups that came out in 1989, this rare Jaleco "cute'em-up" sports some nice pixel art, and challenging boss battles (mostly due to the huge hitbox). The Jaleco Mega System 1-A hardware slows down quite a bit when there are a lot of sprites on the screen, giving a little breathing room for tight dodging, but I don't think that was intentional (ala Cave). Between stages, there is an interesting slot machine challenge for obtaining shot power-ups, bombs (they call hypers), and 1ups.